Manifest /v./ (man eh fest) To make that which is unseen seen. This is one of my favorite words. Such a powerful word. Please know that you have all you need to create the life you dream of. Believe it and move forward in the direction of your dreams fearlessly/passionately, leaving all doubt behind. You can do it! 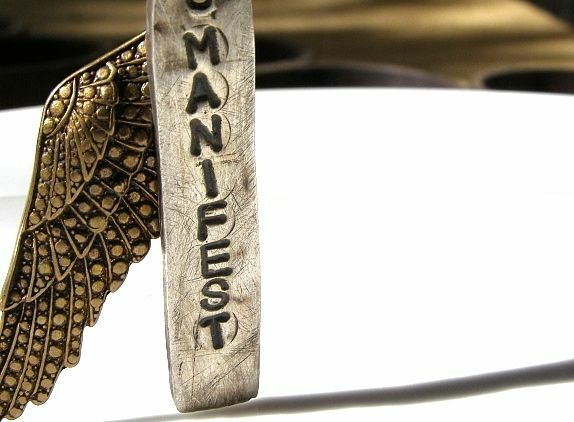 Manifest fine silver charm is handmade by me from precious metal clay. it is .999 pure silver. The brass wing is a found component symbolizing your dreams taking flight. Both charms are suspended from a oxidized sterling silver chain. Create your own word of inspiration and decide what type of charm you'd like to include. It's all about you enhancing your life and the life of your loved ones. I'm here to help.